As an avid runner, I was really excited to chat with Nathan Freeburg about his site, Minneapolis Running. Nathan started this site because he wanted to share his passion for running and combine it with information about local races, running groups, and tips for runners in Minneapolis (and anywhere, really). It now has several contributors and traffic is growing on a steady basis. Minneapolis Running has the same issue a lot of blogs have — generating new traffic, keeping visitors coming back and engaging with them on their site. There are a lot of avid runners out there and Nathan and his team just had to figure out how to get in front of them and showcase their expertise. Originally Minneapolis Running was just looking for some cool social media buttons to help spread the word about the site and share content. In July of 2014 they found AddThis and started using the share and follow buttons because they didn’t conflict with the theme of their site. But before long, they were experimenting with Recommended Content and Audience Targeting. The first test with AddThis Audience Targeting rules was to target all visitors and promote their Runner Bag to help collect email addresses and grow their subscription list. Following the awesome performance of the running bag test, they have now rolled out several other rules targeting multiple audiences – including the very popular “Get our Free Half Marathon Training Plan,” which resulted in 48 subscriptions in less than 2 weeks! 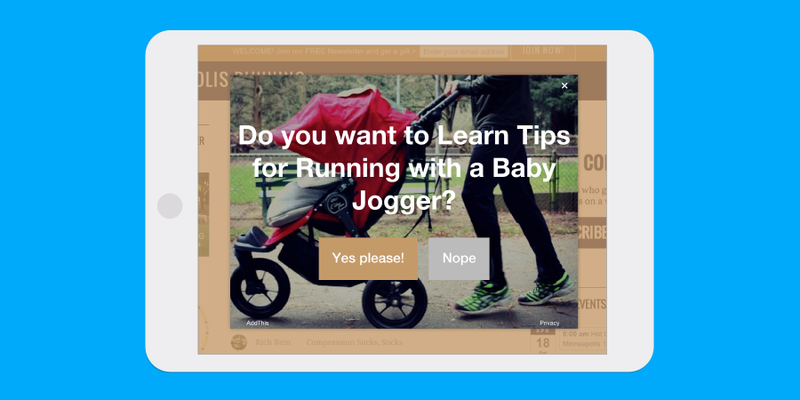 Minneapolis Running is certainly using the Audience Targeting tools correctly by testing messages and audience targeting (like showing visitors interested in family tips on running with a baby jogger).